With the assistance of our talented team of professionals, we are providing a high quality range of Wooden Chakla. 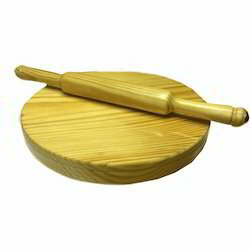 Owing to our expertise in the concerned domain, we are engaged in manufacturing a wide range of Wooden Chakla Belan. Available with us is a Kitchen Polpat, which is offered at market leading prices to the clients. This range is manufactured using high quality materials and advanced machinery, at our associated vendors’ end. In addition to this, we make this range available in varied sizes and designs to meet clients’ specific demands.